With Rit DyeMore Synthetic Fiber Dye you can now dye polyester, nylon, acrylic, rayon, and poly/cotton blends. It comes in a variety of colors that you can mix to get an infinite amount of colors. The All-Purpose Rit Dye also works on rayon and nylon, along with cotton, linen, silk, and wool. Browse all Rit dyes here. Dry clean only and fabrics that can’t withstand heat shouldn’t be dyed, but if you want to try, test out a small piece first. Some non-fabric plastic items may be able to be dyed, like buttons, beads, and legos. 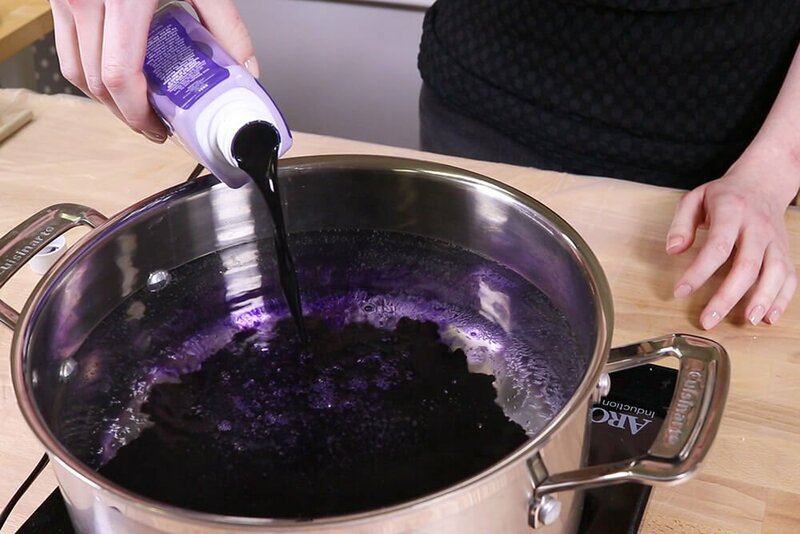 For heat sensitive items, turn the stove off before or a couple minutes after adding the plastic object to the dye bath and keep an eye out if it starts to melt. 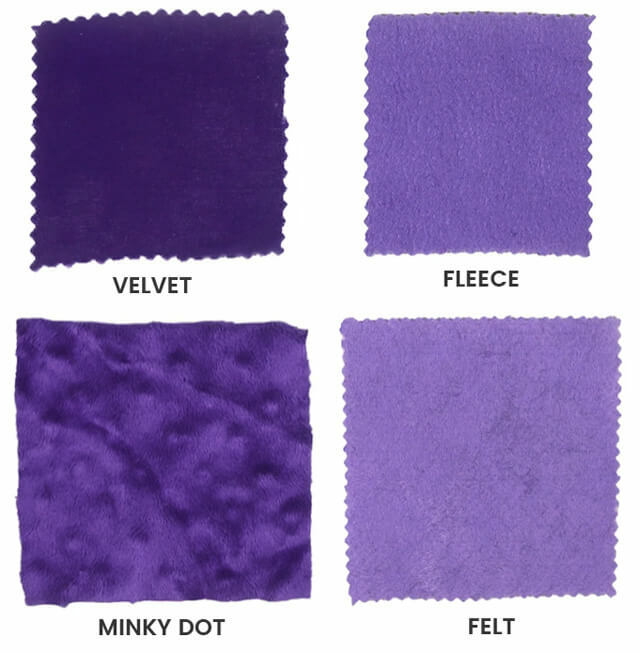 Read our article on fabric dye for more information about the dyes we carry. Different synthetic fibers will dye very differently. We tried dyeing many materials to see how each takes the dye. Synthetic fibers need lots of heat when dyed, so the stovetop method is the best. Pre-wash the fabric to remove any finishes with warm, soapy water so the dye will absorb better. 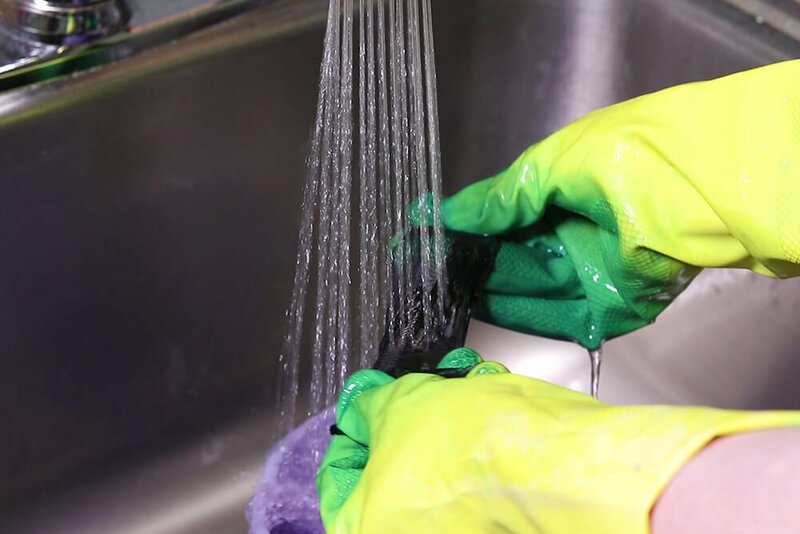 Wear gloves whenever handling the dye and cover any surfaces that need protection before starting. Fill a pot with enough water so the material can move freely. Heat the water until it’s simmering or almost boiling. Shake the dye well and add it to the water. One bottle will dye up to 2 pounds of dry fabric. To get dark or saturated colors, double the amount of dye, especially with polyester. This is a small amount of fabric, but we’re using a full bottle to get a saturated color. Add a squirt of dishwashing soap and stir well. Put the fabric in the dye bath. The material should already be wet. 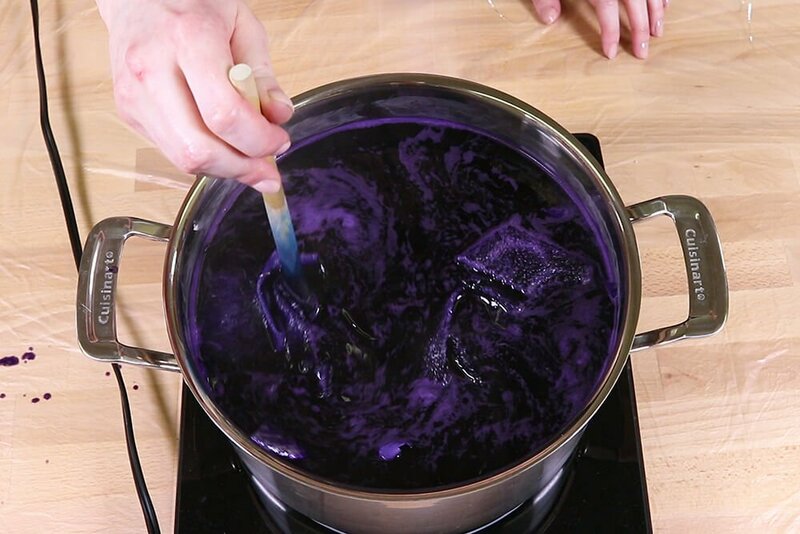 Stir continuously for about 30 minutes with the water on a low simmer, about 180° F. Make sure the dye is getting to all parts of the fabric so it won’t be splotchy. Polyester should remain in the dye bath for at least 30 minutes, but other materials may come out sooner. Some nylon fabrics dye very quickly and darkly. When your fabric reaches your desired color or after at least 30 minutes for polyester fabric, remove from the dye bath. Keep in mind, fabric looks darker when wet. Rinse in a stainless steel sink with warm water, then cooler water, until it runs clear. Wash in warm, soapy water, rinse, and hang to dry or dry on a paper towel. The fabrics ended up dyeing a range of colors from lilac to almost black. These differences are mainly due to the different fiber contents. Here are our observations. The gabardine dyed nicely to a light to medium purple, as did the chiffon. The mirror organza dyed lighter, but it’s also the most sheer of the polyester fabric. The surface remained highly reflective and shiny. The satin, also a medium purple, retained its beautiful shine. The velvet dyed the darkest of the 100% polyester fabric. The pile remained soft with a nice luster. The Minky dyed a medium purple and also kept its soft feel. This Minky has a raised dot pattern that started to disappear due to the high temperatures. The fleece and felt dyed a light purple. If we had left them in the dye past 30 minutes, they may have retained the color better. Before they were rinsed, they appeared more of a medium purple, but some of the color washed out because it takes longer for these fabric to fully absorb the color. They were the thickest fabrics. This particular broadcloth is 80% poly and 20% cotton. Notice how it dyed lighter than the poplin, which is 65% polyester and 35% cotton. 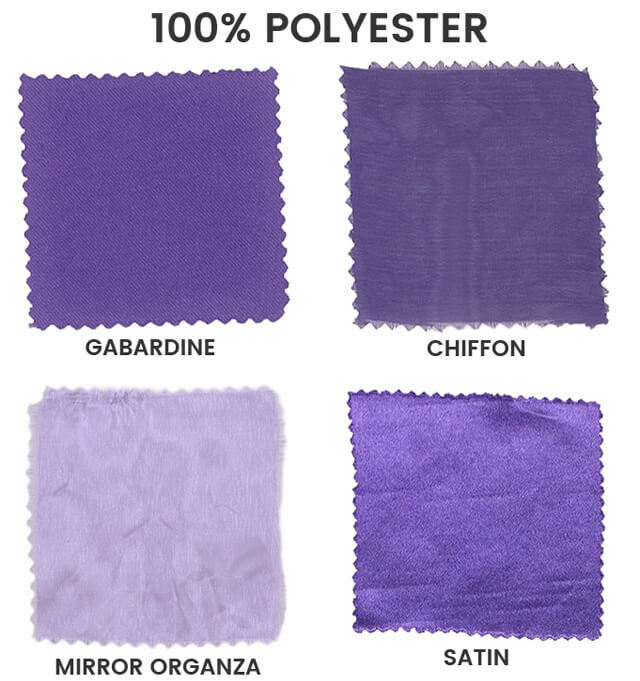 The higher the polyester percentage in poly/cotton blends, the lighter it will dye. The broadcloth and poplin dyed evenly, but not completely solidly. There are slight variations in the fibers. The polyester spandex is 84% polyester and 16% spandex. It dyed a medium color. This faux fur is 70% acrylic and 30% polyester. It dyed a saturated medium purple, but in a slightly warmer tone. The fur is dry clean only, so it did shrink and become a little misshapen in the hot water. It also lost some of its softness. Other faux furs will likely dye differently. 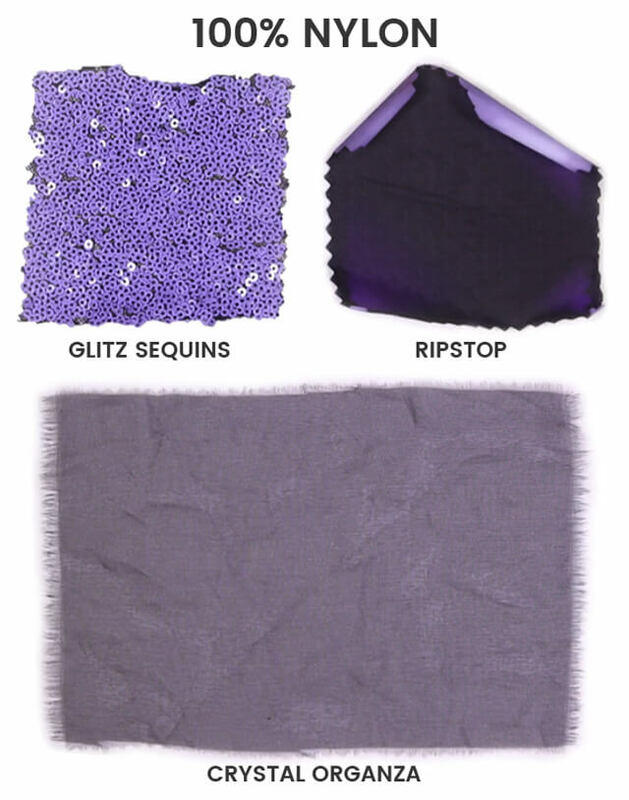 On the glitz sequin fabric, the sequins dyed a lighter purple, while the backing became darker. It took a while for the sequins to dye even though they’re nylon. The ripstop dyed a dark purple, but the edges curled tightly when hot, so it didn’t dye evenly. The crystal organza dyed a more muted purple and seemed to loose some of its sparkle. 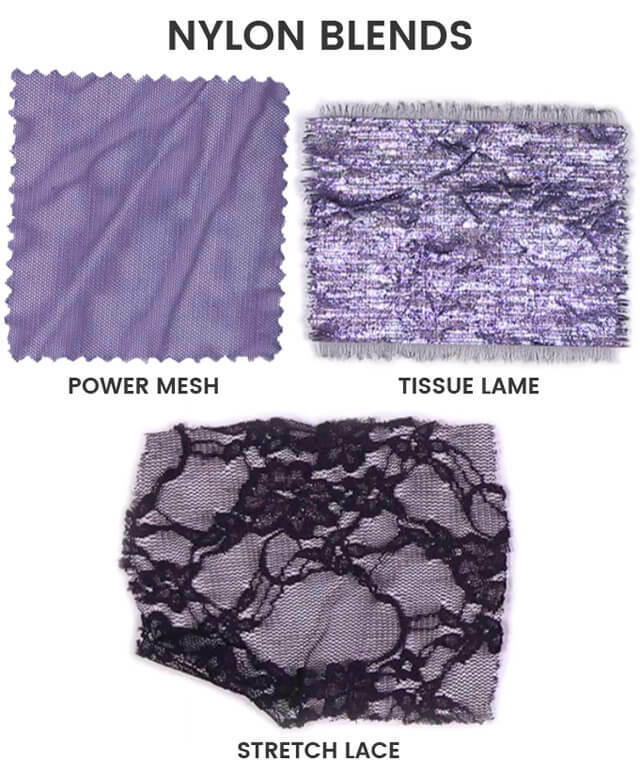 The power mesh is 90% nylon and 10% spandex, but unlike the stretch lace, it dyed a nice medium purple. The dye created an interesting effect on the silver tissue lame. It’s 51% metallic and 49% nylon. 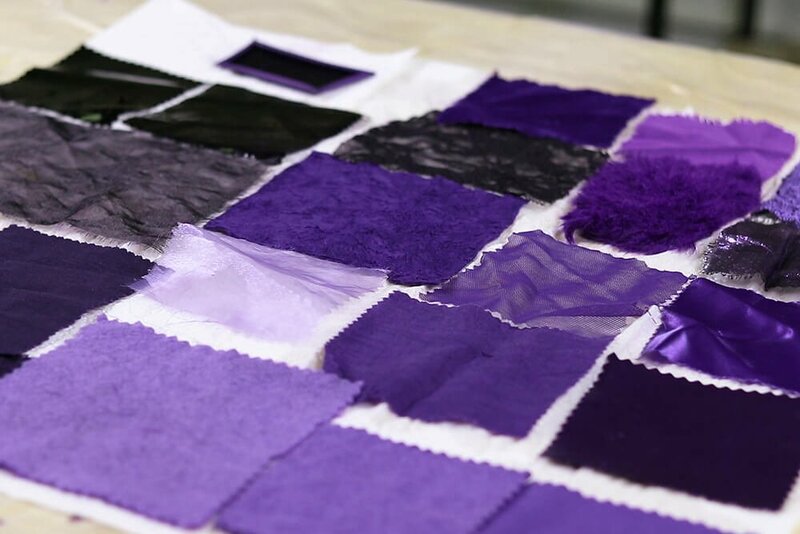 The metallic fiber dyed a light purple, while the nylon fibers became a dark purple, giving it a striated look. The stretch lace is 95% nylon and 5% spandex. It dyed very quickly and became a dark plum purple. If taken out sooner, it may have been lighter and brighter. The Sunbrella canvas outdoor fabric dyed a medium purple that’s quite a bit warmer in color and more saturated than the rest. 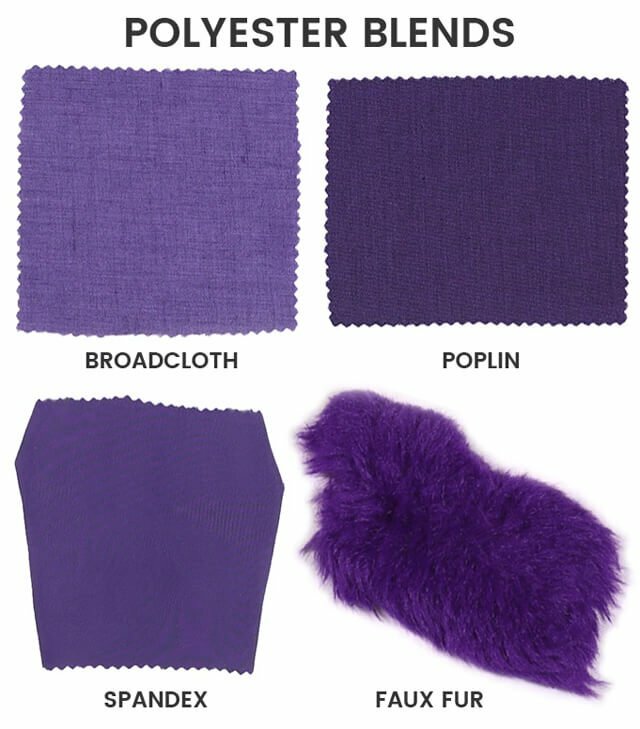 The faux fur has a lot of acrylic in it and similarly dyed a warm, saturated purple, though darker than the Sunbrella. The color of the rayon challis fabric turned out to be a dark purple that’s slightly bluer than others. We threw in a few vinyls not knowing if they would dye or not because vinyl isn’t listed in the materials Rit DyeMore will dye. 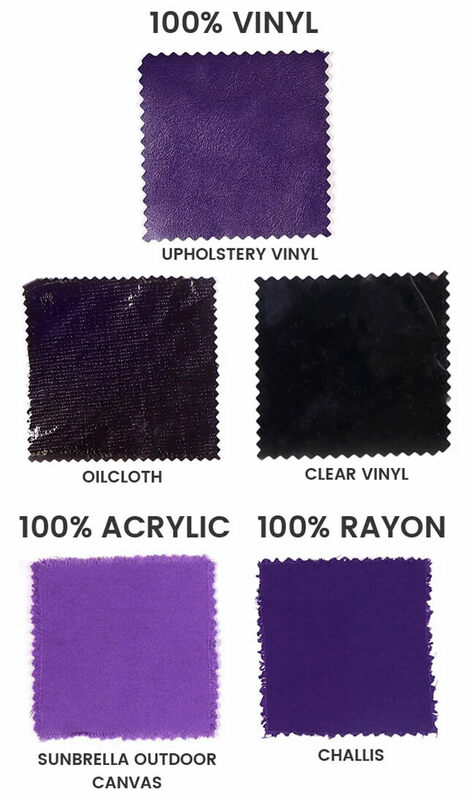 The upholstery vinyl dyed a beautiful dark purple while retaining its gloss. The oilcloth turned an extremely dark purple that’s almost black. The clear vinyl appears black, but if held up to the light, you can still see the purple. With both the oilcloth and clear vinyl, if left in the dye a short amount of time, the color may have turned out lighter. Of course there are many other fabrics that Rit DyeMore will work on, but we hope this sampling is helpful. As with other dyes, it’s hard to know exactly how the color will turn out because there’s many variables like amount of dye, time in the dye bath, the temperature, and the type of material. Even the fabrics that had the same type of synthetic fibers dyed very differently. We suggest testing small pieces of fabric, if possible, to figure out what combination of variables will produce the results you want. What is the best dye for bras? Will it work on 100% wool? I have a garment that is 100% polyester and already a medium red with a slight orange cast. I would like to make it a dark burgundy. Would you recommend creating a burgundy color in the Rit dye or go more towards a brownish black? BEST ANSWER: I'd say start with the burgundy color. If it doesn't seem to be doing what you want, you can always add more black and brown. Or you can re-dye it after it dries. Dyeing is an experiment every time! Can this be used on viscose? BEST ANSWER: Yes, viscose is a rayon fabric. The All-Purpose Rit Dye also works on viscose. I have curtains that are currently light yellow, brown and cream-they are a poly/rayon blend. I would like to dye the grey. They are dry clean only. Is this possible? Thanks! BEST ANSWER: Unfortunately, the gray dye will not cover the pattern, especially dark colors like brown. Since hot water is required, we wouldn't recommend dyeing dry clean only items. I have a baby blue 50/50 cotton/poly heavy duty sweatshirt that I'd like to dye navy blue. Will Rit All Purpose Dye do the trick or do you recommend (strongly?) using Rit Dyemore Synthetic Fiber Dye? BEST ANSWER: The poly/cotton would dye somewhat with the All Purpose Rit Dye, but you wouldn't be able to get a dark color like navy. So for your situation, we definitely recommend the Rit DyeMore Synthetic Fiber Dye. if I want to dye something that is green to light blue will it work? I have royal blue polycotton shirts with 65% polyester and 35% cotton. Using RIT Dye More Synthetic Graphite, will they dye to proper black? BEST ANSWER: Rit has graphite instead of black because polyester is especially difficult to dye dark. It's hard to say for sure but it may come out more of a navy since it's starting out blue. if I want to dye something that is orange to light blue will it work? BEST ANSWER: This will not work on synthetic fabrics. For natural materials like cotton, there's Rit color remover, which removes/reduces the color without damaging the fabric like bleach does. However, there isn't a good way to remove the color for polyester or other synthetic fabrics, which is necessary if you want to dye an orange item light blue. When your came out darker than you want, what can be done to lighten it? BEST ANSWER: Different materials absorb the dye at different rates. For example, nylon dyes more quickly and darker than polyester. You can you less dye and/or leave it in the dye for a shorter period of time so it doesn't get too dark. 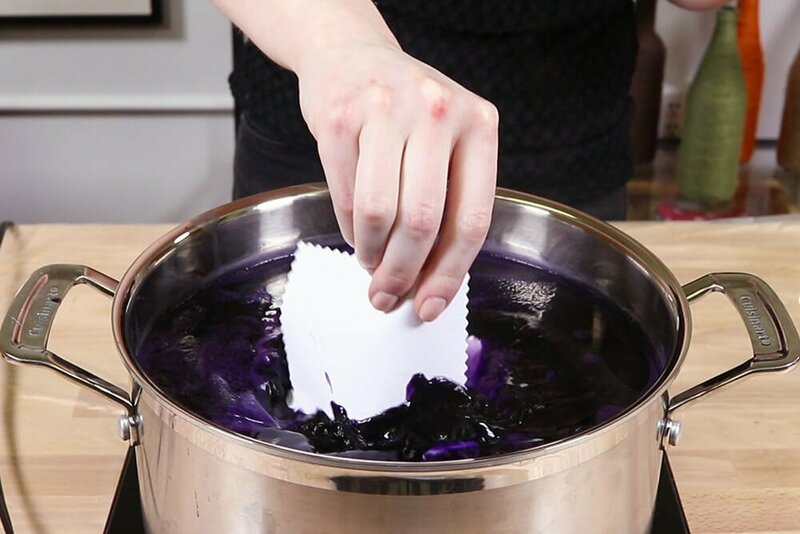 If you've already dyed something and it's too dark, there isn't a great way to make it lighter. You may be able to get it a bit lighter by washing it multiple times in hot water. Can I re-use the synthetic dye? I have day old dye in the pot from doing my test, which worked beautifully. Can I add more water to the pot and more dye to dye the garment? I would bring the water back to 200deg. Thank you. 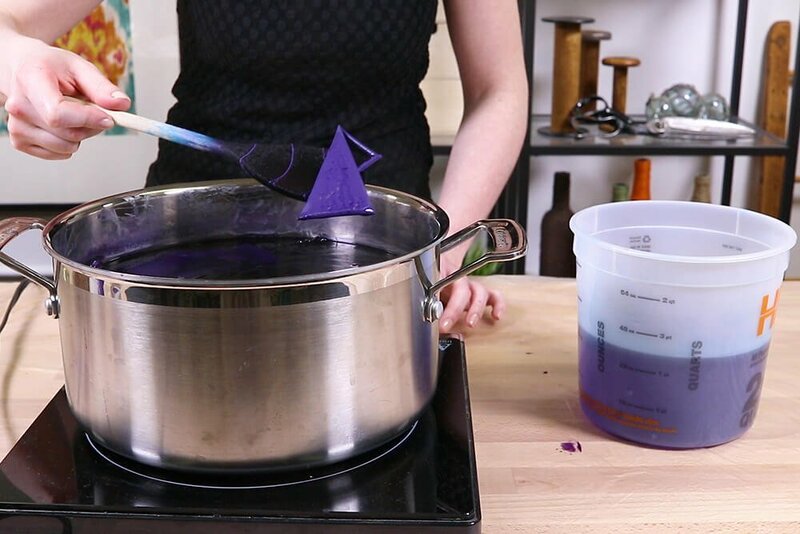 BEST ANSWER: Yes, you can add more water and dye to the dye bath you tested with. I have a dress 60% polyester, 35% rayon & 5% spandex. It's heather grey and I want to dye it red. Possible? BEST ANSWER: You may be able to get a muted red if the heather gray isn't too dark. It would still have the heathered look. I have a dress that is “gunmetal grey” (70% rayon, 19% polyester, and 11% nylon) and I would like to dye it navy blue. Possible? BEST ANSWER: Possibly, but it will probably be a more muted navy because of the existing gray color, especially if it's a dark gray. I want to keep same color on my SV boat sail covers. They are large areas. Is it possible being they are sunbrella material?. Suggestions please? BEST ANSWER: We dyed Sunbrella fabric successfully, however I can't speak to if dyeing it in very hot water damaged the water repellency of the fabric. The high heat is necessary in the dyeing process. It would also be difficult to evenly dye large pieces of fabric. I want to dye a dark teal 100% polyester pillow cover hunter green. I have read that you can not use rit color remover on 100% polyester fabric. Will I be able to acheive hunter green from dark teal if I am not able to lighten the dark teal first? BEST ANSWER: Unfortunately, probably not. I have an old wedding dress from 2004 that is 100% polyester it is off-white I need a bright pink color should I buy a darker pink since it seems to come out lighter on polyester? BEST ANSWER: There's only one color of pink available so the darkness of the pink depends on how much dye you use along with kind of material it is. For polyester, yes, use more dye and keep it in the dye bath for a longer time. Can you use synthetic dye on canvas shoes?? BEST ANSWER: Yes and the all-purpose Rit dye would also work. Any tips for what color to use? Would a orange give me more of a brown? BEST ANSWER: Polyester in particular needs high heat throughout the time it's in the dye bath, so unfortunately you may not be able to achieve brown since it's too large for the stove top method. BEST ANSWER: DyeMore will work on 100% polyester. I have a dress that’s a grey metallic material and it’s faded, can I dye this another color? BEST ANSWER: It's hard to say how this specific fabric will dye. Do you know what the content is other then metallic? The metallic lame we tried did dye to a certain extent though not as dark as the nylon percentage of the fabric. You would probably be able to dye the dress, but the color may be a little muted since it's starting out gray. The other thing to take into consideration is how the fabric will react to very hot water. Though synthetic materials don't generally shrink like natural fibers, it's possible the heat could damage the fabric. So basically, if you're not going to wear the dress in its current state, you might as well go for it, but there is a risk that it won't turn out well! I have a 100% polyester dress thats cranberry in color can it be dyed a true red? BEST ANSWER: The existing color would have to be removed or reduced first. 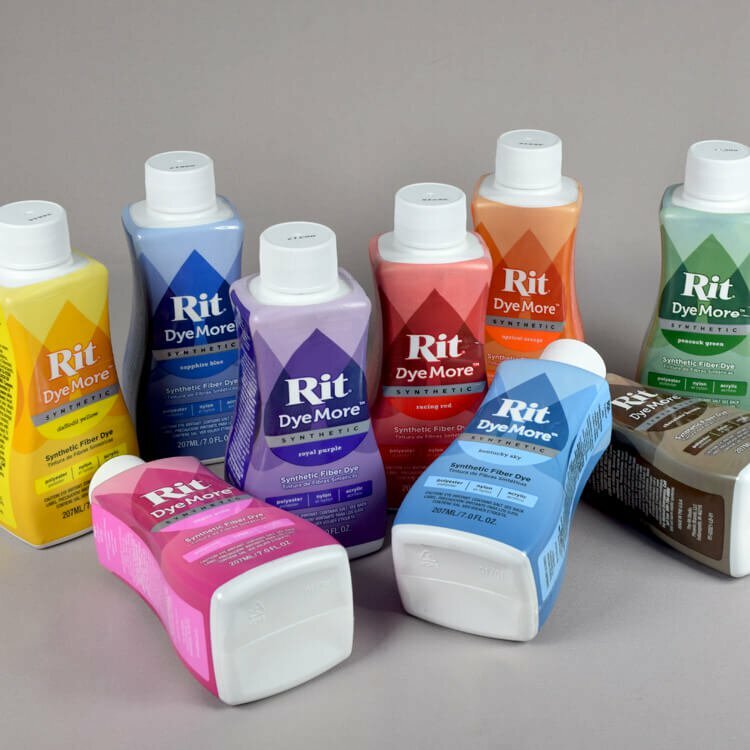 Rit makes a color remover, but unfortunately it only works on natural fibers. So cranberry to true red would not work. Can I use the synthetic DyeMore product to dye a 100% cotton item? Should I use the stove top method? I have a product with 7% metallic in it, is this a problem? Can I dye a garment using the stovetop method if I am only supposed to tumble dry on low? Is the stovetop too much heat? If the garment is something you care about, you probably shouldn't risk dyeing it because of the high heat. But the care instructions are often on the conservative side, so it may be fine. Synthetic fibers don't tend to shrink in heat like cotton does. They will melt at high temperatures, but usually at much hotter temperatures than you would get to on the stovetop. The only way to know if it will work is trying it, if you feel you can risk it! Can you dye an 80% acrylic and 20% polyester dark green knitted hat more or less the same color? Thank you. BEST ANSWER: This dye works on acrylic/polyester, but if it will just dye over the old color and won't replace it. I have a dark purple David’s bridle dress that I want to dye a light purple. How do I do that? BEST ANSWER: If it's a synthetic material, like polyester, there isn't a good way to lighten it. With natural fibers, you can use Rit Color Remover to get rid of as much color as possible before dyeing, but it doesn't work on synthetics fabrics. Will it work on a neon green hat that is 100% acrylic yarn?? BEST ANSWER: The neon green will affect the resulting color, but the dye will work. I want to dye lace curtains, probably polyester. How do they dye, dark or lighter? BEST ANSWER: Polyester tends to dye lighter than other materials. If you want to try to get a dark color, leave it in the dye bath for more than 30 minutes and make sure the water is very hot throughout. Can you dye polyester spandex blends? BEST ANSWER: Yes, we dyed an 84% polyester/16% spandex blend and it worked well! Can you dye shoes with this product and if so how? BEST ANSWER: It depends on the shoes, but dyeing synthetic fabrics usually requires submersion in very hot water, which could damage the shoes. Can you dye a dark fur lighter using the dye? BEST ANSWER: You cannot make a dark item light without removing the dark color first.